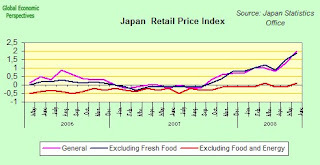 Japan’s core consumer prices, which include energy and processed food, increased in June at the fastest rate since the Japan's lost decade-and-a-half began in 1992 - at least if we strip out the temporary spike caused by the effect of the consumption tax increase in 1997. The increase however came almost entirely from higher energy costs and food prices. Core prices, which exclude fruit, fish and vegetables, increased 1.9 percent from a year earlier after gaining 1.5 percent in May ,while "core-core" prices - excluding food and energy (and which provides a a measure of inflation similar to that used in, say, the U.S.) rose 0.1 percent in June from a year earlier. Thatis only the second time in the past 10 years that these prices have increased, but with the Japanese economy slowing rapidly, and recession seemingly on the horizon I wouldn't be holding out too much hope that this measure is going to stay in positive territory for very long. Consumer confidence fell in June to the lowest level in at least 26 years because prices of daily necessities are rising faster than wages. Goods purchased at least 15 times a year climbed 4.2 percent in June, almost twice the pace of the previous month. Wages rose 0.8 percent in May. And as we saw yesterday Japanese exports shrank (y-o-y) for the first time in nearly five years in June as the growth in shipments to emerging markets that had underpinned demand failed to offset the global impact of the US and European economic slowdowns.